There are kitchens, and then there are kitchen trends. The first is what it is, a kitchen. Here you cook, eat, share family time and then, ultimately spend time at a party! We all do it. 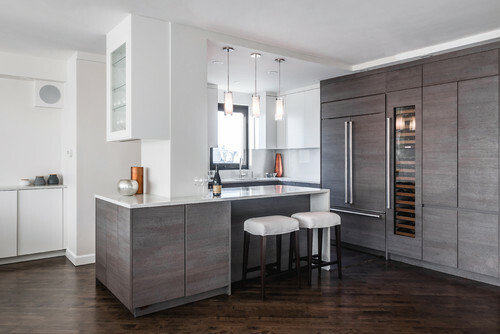 Then there are kitchen trends, the things that determine whether or not the new kitchen you are buying, are about to buy or have had installed for a while is still in fashion. For many, kitchen trends will determine the ultimate look and feel, whilst others aren’t that necessarily concerned. For us, it’s 50:50. You want your kitchen to look the part, especially when you are spending your hard earned cash on what is arguably the most expensive piece of furniture in the home. On the other hand, you want your kitchen to be fully functional, how it is designed, meets your lifestyle and requirements is as big an effort than the actual look and finish. Kitchen trends help inform us what is current and what styles will be on the market in the next 5 – 7-year cycle. For example, we are just starting to see the back of the cream colours and we have entered arguably, the third year of the grey kitchen palette. So, what kitchen trends can we take from this year and what will be seeing a little more of for 2019. In the 90s there was a surge of new kitchen colours that came to market and whilst we saw green and yellow making an unwelcome visit (we even had a green kitchen range) in the diaspora of white and wooden kitchens, we also that they went out of fashion very quickly. The two problems were, in short, it didn’t look very nice and they were expensive to produce. Luckily over time, we have found ways to solve both issues. Door styles have changed drastically (see below) and the way manufacturers can piece together a fantastic looking colour with state of the art colour matching technology only adds to it. Blue is all the rage right now, and to be honest, it has been for about 18 months. Dark blues are very in trend. Like dark and light grey over the last few years, blue is finding a resurgence with some exceptional muted tones that bring out the best of all worlds in this colour. Before, it was an accent colour, but now it is a kitchen colour in its own right and from what we’ve seen with the latest colour profiles coming out of trade shows and the minds of the best kitchen manufacturers is, it’s here to stay. Tip: Darker shades pair with brass handles, light oak wood panels and white countertops/tiles beautifully. We are seeing handleless kitchens take another step forward and the big revolution is all about how the handle or handleless door is actually opened. Let us explain, with handleless you have two main ways of opening the kitchen door. The first is that the door has a lip of some nature so your fingers pull on the lip to open. The second is a push mechanism, which, however, have a lot more issues. Here, the requirement is that the hinges don’t fail on you and in our experience, you have a run of around 2-3 years before the spring mechanism gives up the ghost. So what’s new? Well, it’s not really new but again, manufacturing has made it easier to produce and now, very cost effective. Handle inlays are the new talk of the town. This is where the top of the door (on a draw) and the bottom of a door (unit) has an inlay machine drilled in and then a handle inserted to make opening easier than a lip – but it still remains handleless on the door. It’s a way of keeping things very simple and yet, engineering very high. Kitchens with this arrangement will be in part, the future of the handleless kitchen unit. Your kitchen door is what establishes around 70% of the look and feel of your kitchen. So the difference in style between a shaker door, a shaker door without beading, a shaker door with and an extra inlay and so on, will have a dramatic impact on your kitchen style. The big leap that people are making is the slab kitchen door. This is just a kitchen door that has no framing of any kind, it essentially looks like, a slab. With the new colours on the market and the handleless technology being where it is, it’s no surprise that we are seeing more of these designs appear. We’ve been influenced by the Nordic design trend for some time now and with the idea of hygge – still a thing – and people leading a slightly more minimalist lifestyle, this design feature is perfect for the latest kitchen trends and fashion going into 2019. Tip: Keep as one uniform colour as your kitchen will appear to be larger with this style and because of the lack of handle (in most designs) light will have an impact on the total colour and shading.